Next up in the 2017 PopCult Gift Guide we have a party game that lets players cut loose with all the acting chops they can muster. This is the perfect gift for anyone who enjoys multi-player games that let them ham it up and use funny voices. Accentuate will have you in stitches. In Accentuate, one player is given a card with a movie quote. That player has to deliver that line in a random accent. If their team can guess which accent is being attempted, They score. Bonus points come into play if they know which movie the quote’s from, who said it, what year it came out, and the director. The more you know, the more you score. The movie quotes are from all types of films–rom coms, action, drama, oldies, superhero and more–and the accents you’ll have to quote them in will be beyond wacky. The rules are a little more heady than that, but you get the gist. Accentuate comes with 500 Quotes on 250 Cards. There are also 120 Accents Cards (with 30 Different Accents), 4 Accent Lists, Die, a Timer and the Rules. You don’t have to be good at accents to play this game. You just have to be willing to have an uproarious good time trying. And even if you think you’re good at accents, the wacky combos could throw you off–you never really thought of mimicking a superhero flick in a Southern accent, right? The cards make for some fun trivia even if you don’t know the answers. Maybe it’ll bring back some memories, or you’ll learn something new so next time you play you’ll nail it. Besides, the trivia stuff is secondary–the accents make the game. 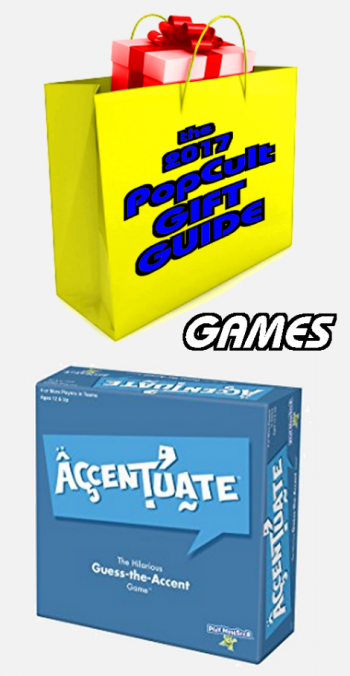 Accentuate is a great game for four players, aged twelve or older. It can be found online at Walmart and Barnes & Noble, and at game retailers nationwide for under twenty-five dollars.